Sun slowly overtakes the shadow in the hangar as the overhead door moans, opening to reveal a bright blue sky. My manifester has not yet arrived, so I busy myself closing a tandem rig, taking out trash, vacuuming, cleaning the bathroom... The first group of tandems walks around the corner. I greet them, briefly introduce myself, and apologize for the toilet brush in my hand. I get their paperwork started, then take their payment, start them on the training video. They are a 30 something aged group of guys who brought their family out to watch. Stereotypically, the big guys are jumping, and their wives just watch their kids and mumble how they would never jump out of a perfectly good airplane. I made my first jump, static line in 1989, got the static line jumpmaster rating in ’93 and instructor rating the next year. I earned my riggers ticket in ’95 and opened a dropzone, Skydive Kansas. With my favorite discipline being “students”, in 1997, I earned an AFF/I. In 2000, I was appointed a Coach Course Director—that was when it was still an appointment. But I wanted more. 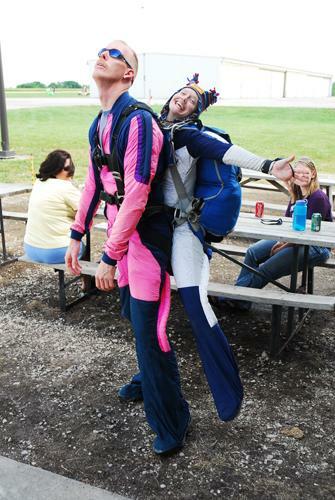 In early 2004, I mentioned I wanted to get my tandem instructor rating. At that time I weighed 98 pounds. Often I was told, “You’re not strong enough,” and “There’s no way you could manage it,” and even “You’re gonna kill someone.” But I had some key supportive friends and I took the first important step: I believed I could do it. I needed more information. Am I really strong enough? Could I reach the drogue? What about steering and flaring with that high toggle pressure? What is really involved in being a tandem master? I had probably close to 1,000 jumps videoing tandems from various instructors, so I had the benefit of learning by demonstration. Plus, being small, I was a favorite passenger for candidates earning their ratings, so I had the benefit of perspective as a “pretend” student. That wasn’t enough. I sought out and was fortunate to find Holly Mengel, who had been a 130 pound female tandem instructor for a couple years. I picked her brain and found both inspiration and practical advice from her stories. I was also inspired by tales of Georgia “Tiny” Broadwick, who despite her stature managed to be the first person male or female to freefall and to jump from an airplane. Her brave determination and ingenuity compelled me to overcome stale pretense and just find solutions. In May 2004, I earned my Strong Tandem Instructor rating, and Bram Clement from SkydivingRatings.com was our examiner. He did a fantastic job and we thoroughly enjoyed the knowledge and experience he shared with us. At first, he had doubts as to if someone small could do the job necessary. Bram is tall, and we both were not sure how the eval jumps would turn out. I admire Bram’s trust in his own abilities, plus his confidence in me! And despite having the flu during the course, I completed the requirements and rekindled that feeling of accomplishment I gleaned from my first jump! It’s not about strength. Leverage is a concept my Dad instilled in me since I was young, working as his gopher while he would remodel old houses. 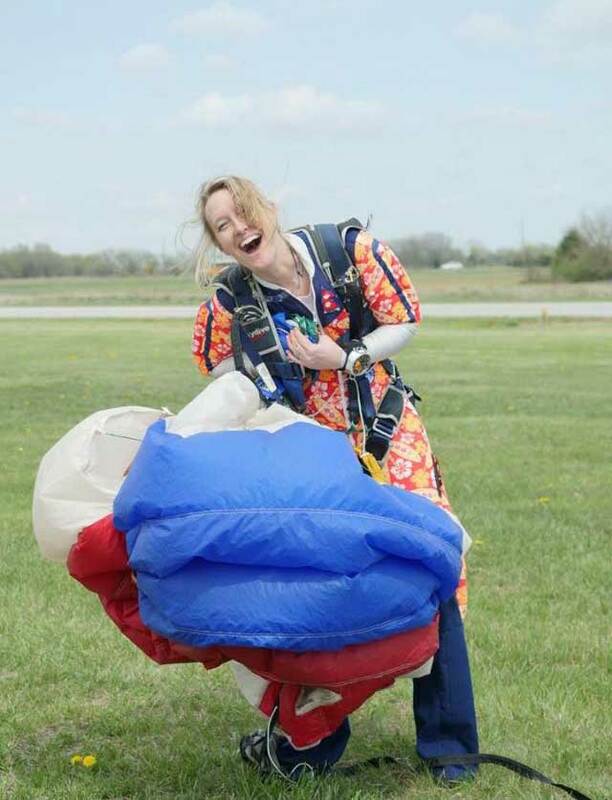 I refined this skill as a rigger -- I packed reserves before I ever packed my first ZP canopy, so it was amusing how other “stronger” skydivers could not manage to put a main into the bag, or struggled closing a container. I would walk over and easily whip it and pin it. Leverage. I have a few secrets. Strong Enterprises was gracious and supportive to me, and modified two of our containers. They shortened the main lift web two inches, making just enough difference that reaching the drogue is easy for me. The tandem rig weighs about 50 pounds, so I conserve my energy putting the rig on by sitting on the ground, putting my arms in and fastening the chest strap, then leaning over to stand up and connect the B12s on the leg straps. Getting up in the plane at first was a challenge, but I discovered if I leaned forward slightly and got my legs under me first, I could easily and smoothly go to me knees in our Cessna 182 without even disturbing anyone next to me. Hooking up in the plane and exit has proven to be a point in the jump that requires probably the most energy with larger or inflexible students. I usually sit behind the pilot and my student sits in the back. I have the student turn around to hook up. Before exit, I drag my student backwards as I make my way all the way back to the instrument panel. The student sets their feet out and rests them over the aft side of the step, then holds onto their harness. I set my foot out on the step, put my left hand on the strut and right hand on the door to brace myself as I pick them up and put my back directly to the relative wind. This part can be pretty funny if I have a hanging photographer waiting on me. Several times with some heavier students, while giving a rocking count, I made the “ready” part rock forward a bit too far. Then I have not been able to rock backwards for the “set”… I just continue to fall forwards as the student’s weight pulls us off the plane! No harm done, just a fast count! As I exit, I do a normal bomb out exit, except I anticipate the weight of the student pulls us down at a faster rate than solo. To compensate for that, I aim as if I’m going to pounce flat, right on the tail of the plane. Their weight then pulls down and we find ourselves just shy of head down to the earth, but perfectly positioned belly into the relative wind. From there, it’s a matter of riding it to terminal and maintaining the roll axis. Sometimes I do a complete flip or roll over 180, not purposely, but can easily barrel roll back stable. Freefall, or more aptly drogue fall is a cinch. Again, thinking of leverage, I wear a very large suit with booties and put my student in a suit that is as form fitting as is comfortable for them. I have had some students with poor body position that make me work for heading, but for the most part, since we teach them to do a small confined arch, my leverage is to fly arms and legs out wide if I need to. Under canopy is a blast! I can adapt to my student’s desires and float for a long time, or do a ton of spirals and induce zero G. I mostly jump a SET 360, that’s right, not a 366. Our canopy was one of the original smaller SETs. I also have jumped a SET 400, but prefer the lighter toggle pressure of the smaller SET. To conserve energy, I often pull the toggles down only a little past my shoulder for steering, unless I get an adventurous student who wants to spiral more aggressively. We teach a Tandem/Assisted/Coach progression which most closely resembles IAF. 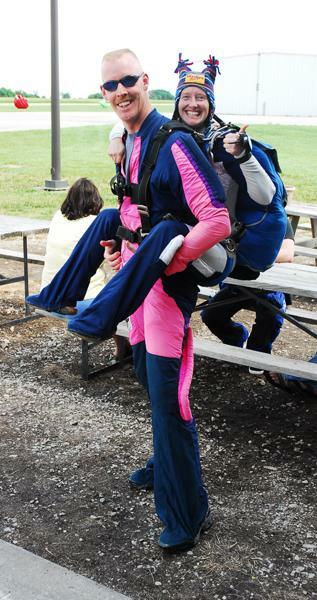 So even our first jump tandem students can pull, help steer, and land with us. At first, I was concerned about flaring without the student’s help, and it’s true it takes some strength. However, I soon discovered, it is actually more difficult to flare as a passenger than as the instructor. Additionally, my “secret” is to pull down to just past my shoulders, then turn my elbows up and then PUSH down the rest of the way. Pushing is easier than pulling at that angle, so it works well. The only precaution I have taken about strength is, if I get a student who is not cooperative on steering, I have them take their hands out of the toggles for landing so they can’t lock up from fear or accidentally overpower me. Setting limits is important. I didn’t start out right away and take 220 pound 6 foot 4” guys like I can now. In the beginning I thought weight was the most important factor, so I limited my students to 150 pounds. As I gained more experience, I slowly raised that limit. I discovered that the most important factor was actually height, since I wanted to make sure my student could raise their legs for landing and not have my feet lag too far behind. The other limiting factor for me is winds. 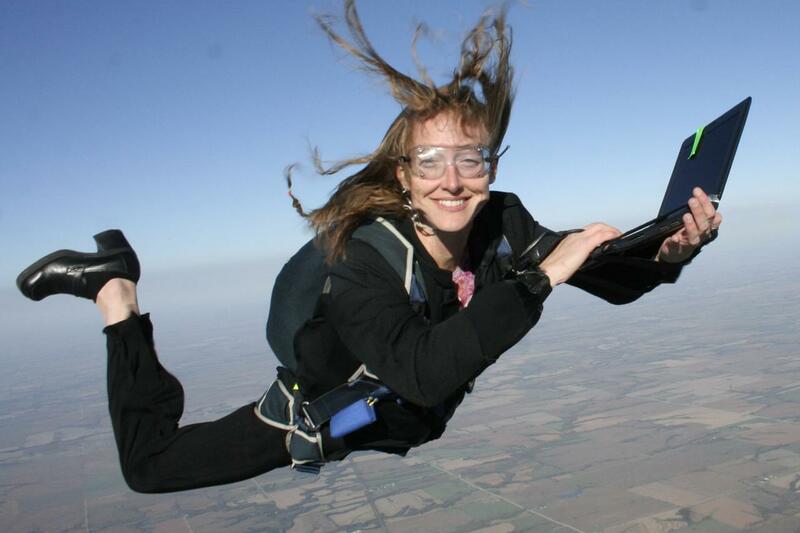 Jumping in Kansas and being small means I have had to learn how to manage high winds or I would not jump much. However, being responsible for another person changes the equation. Again, I approached this slowly, setting a very conservative limit at first and changing it consciously and incrementally. Now I feel comfortable even backing up with a tandem up high as long as I have forward drive below 2,000 feet. I have discovered that my upper limit with a 220 pound student is 23 mph on the ground. With a 100 pound student, that limit is an all too common 17 mph. With a little estimating math, I can safely and accurately choose what jumps I make. Frequently it turns out I end up preferring the shorter heavier students. But here is my biggest secret. If I didn’t absolutely love doing tandems, they would feel like a whole lot more work for me. The enjoyment I get from taking people on their first jump is beyond what I could have ever imagined. Spending time with my student training, then also in the plane, getting to know them… it all creates a connection. I feel proud that I am giving an extraordinary, life changing experience to my tandem students, yet I’m confused why I feel like I am the one getting the gift! 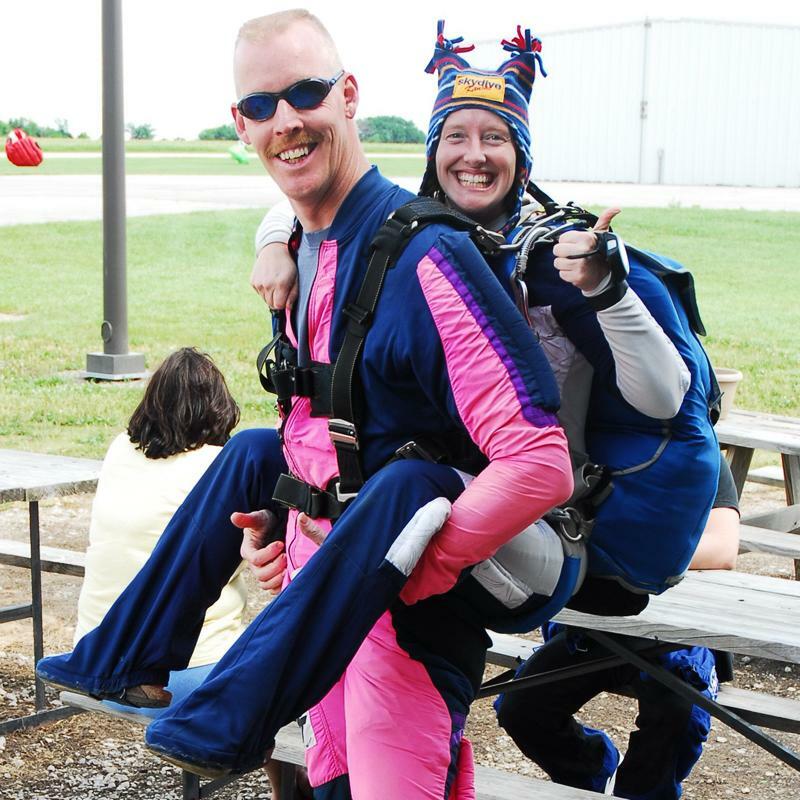 I tell my fellow tandem instructors, we’re parasites, feeding off the energy of these first time skydivers, reliving our own first jump. Many times after landing, I say to my student, “Amazing what is possible when you put your mind to it!” But I’m not sure if I’m talking to them, or myself! I loved reading this. I did my first jump last month and want to start going for my license next year. I was worried that being 5' 2" would leave me limited on what I could do if anything. Is there anything that you could recommend that I should work on before I start my training to make it easier? Visit http://skydiveschool.org for some lessons in USPA's online ground school for your A license. Your size does not inhibit you from experiencing or learning anything. I had a hard time falling fast enough to stay with others when I first started, but many instructors now have ways to help you with that. Check back with me if you have issues with anything in particular! Sometimes we sacrifce the equality of rights by trying to contrive equality of outcomes.